A few years ago, were was only two devices: an iPad and an iPhone. Storyboards were separate for iPads and iPhones. For any device, there was extra code necessary to use the same app in landscape and portrait. With new phone sizes, like the iPhone 6 plus, the iPad Pro or the retro-sized iPhone SE this became a bit more of a problem. Developers could design a different storyboard for every size and orientation. That would be an excessive amount of work. Every new version of the phone or tablet would need to be different, with a separate storyboard. For all devices running iOS 10, that is four iPhones in portrait and landscape, three iPads in Portrait and landscape and ten panels for iPad multitasking. To develop a storyboard or code for each device would mean designing for twenty-four views . If you hear about device fragmentation this is what people are talking about: different devices need different layouts because their screens are different sizes. It’s not just mobile devices that have this problem. AppleTV might run your iOS app. Televisions vary widely in size. AppleTV needs to change the view to handle those differences. 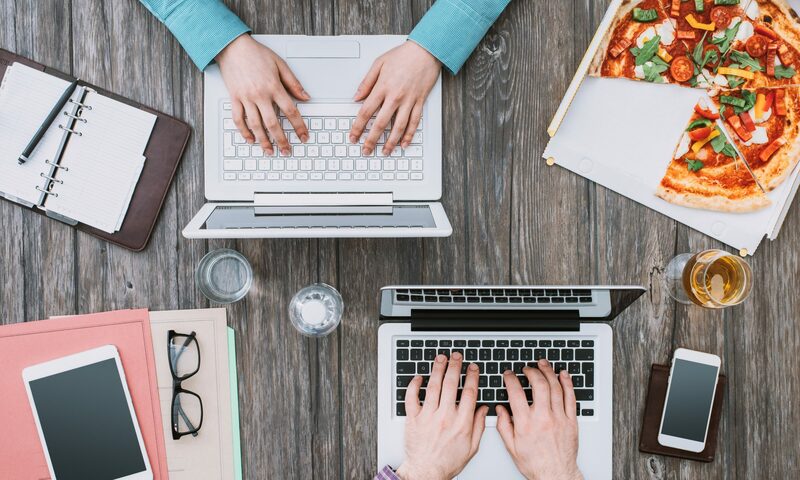 Over that last few years, there have been many solutions to adaptive user interfaces, which are interfaces that adapt their size and shape automatically to the device or window they happen to be in. Apple’s solution to this problem is auto layout, which lets the system do the hard work. Using relations between views, we describe how to layout the user interface. In iOS 8, Apple introduced size classes, a way to describe any device in any orientation. Size classes rely heavily on auto layout. Until iOS 8, you could escape auto layout. 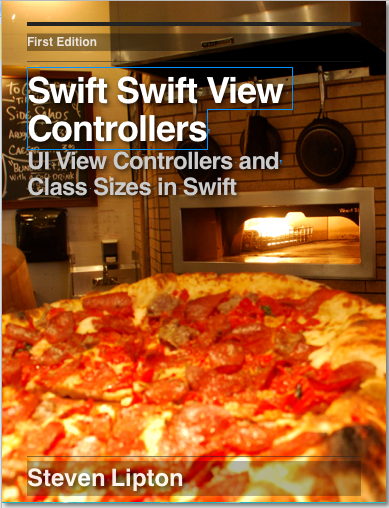 IN iOS8, Apple changed several UIKit classes to depend on size classes. Modal views, popovers, split views, and image assets directly use size classes to determine how to display an image. Identical code to present a popover on an iPad causes a iPhone to present a modal view. There are two sizes for size classes: compact, and regular. Sometime you’ll hear about any. Any is the generic size that works with anything. 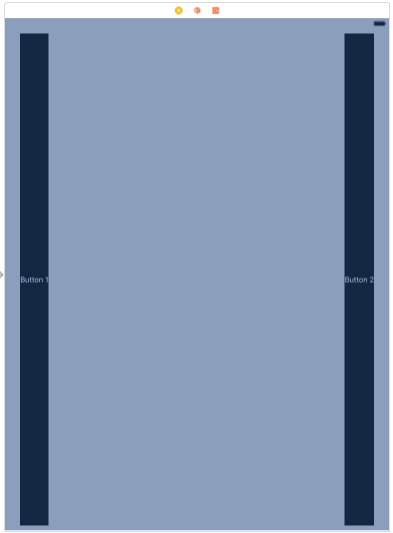 The default Xcode layout, is width:any height:any. This layout is for all cases. The Horizontal and vertical dimensions are called traits, and can be accessed in code from an instance of UITraitCollection. The compact size describes most iPhone sizes in landscape and portrait. The trait of most importance is the width trait. The width is compact on all phones but the iPhone Plus models. There is one exception: the width in landscape is regular for an iPhone 6 Plus, which can cause some confusion. iPhone 6 Plus acts like a iPhone in portrait but an iPad in landscape. For both width and height, the full iPad and the 2/3 iPad for multitasking is the regular size. The 1/3 and 1/2 iPad multitasking modes are compact in width and regular in height. There’s one more variation to compact and regular. You can specify both compact and regular with Any. When you add Any to Compact and Regular there are nine size classes the developer can use. Prior to Xcode 8, developers would have to know what all these sizes are and which device each belonged. 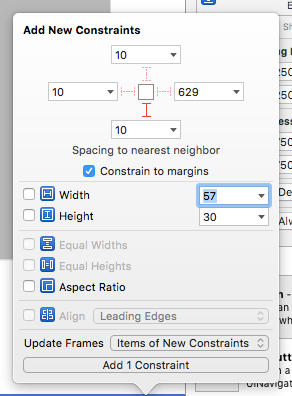 That changed in Xcode 8 with a new user interface for Interface Builder. Xcode displays as selection of devices, the developer selects the devices, then Xcode previews the layout on that device. The any class makes working with size classes a bit more generic, saving work. Our designs start in the width:any height:any size class, covering all cases. If we need a special design, then we use that specific size class. Prior to Xcode 8, any needed to be explicit, and in some places you’ll find explicit uses of any still. Often Xcode 8 hides Any from you, making it implicit instead of explicit. 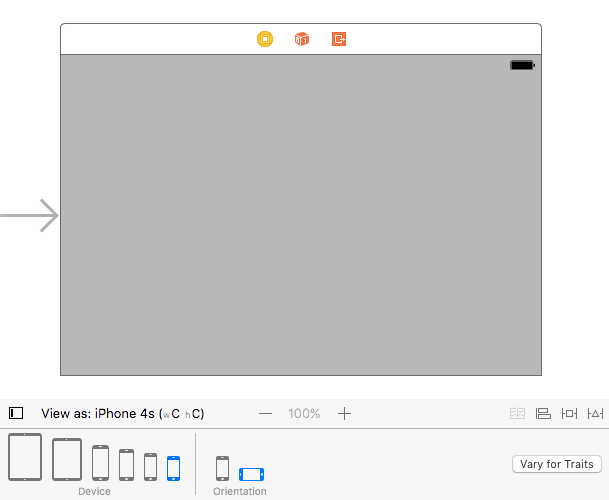 the iPhone 6s is the default device for Interface Builder. Click this text. A new toolbar appears below, with the iPhone6s in portrait selected. Select the iPad Pro 12.9″ on the left. The toolbar changes to include all size classes for an iPad Pro. You’ll notice the screen looks blank. The iPad is too big for the screen. In the center of the toolbar click the 100%. In the menu that appears, click the 50%. To make the device easier to see, I changed the background color attribute of the view to light gray. Select the iPhone 4s and under Orientation set the orientation to Landscape. We get a preview of a iPhone4s in landscape. Zoom in to 100% to see it better. All of this is in the Any size. To change the size for devices, you can click the Vary for Traits button. So far you’ve previewed a blank storyboard. Click the icon for a portrait phone. Add two buttons labeled Button 1 on the top of the scene and Button 2 towards the bottom. In the attributes inspector, Set the Text Color to White and the background of the button to Black. You’ll need a little auto layout to take advantage of size classes. If you’ve never used auto layout, we’ll keep it simple. Select Button 1. 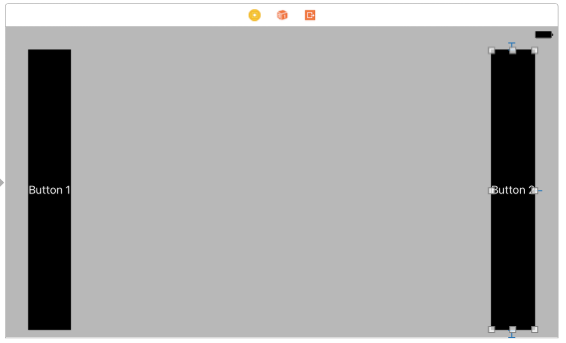 Find the pin button in the Auto Layout menu on the lower right side of Interface builder. Click to get a popup. 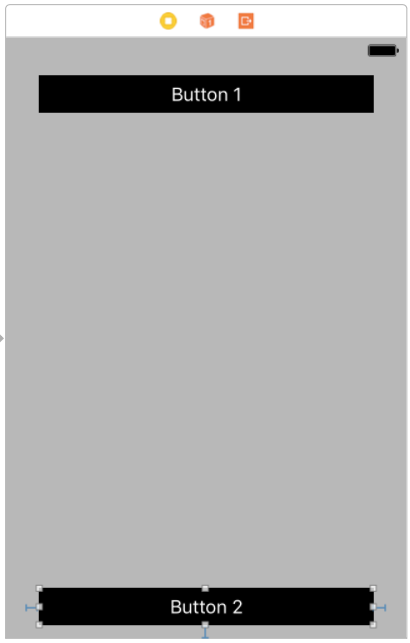 Click Add 3 constraints and the constraints will appear on the storyboard, stretching the button to the correct size and position. Select Button 2 on the bottom. You’ll pin this to the bottom. Click to get a popup. Tab past the first box without entering anything. try 10 then tab for the left pin, 10 and tab for the right pin, and 10 and tab for the bottom pin. Again set Update frames to Items of new Constraints. The popup should look like this. The horizontal and vertical dimensions we refer to as traits. You can change one or both traits of the displayed device. The current traits are found after the name of the device in the view as button. 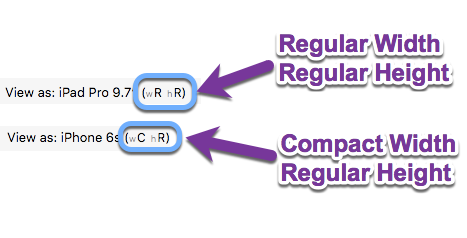 The current view show us a width of regular(wR) and height of regular(hR). The default iPhone6s in portrait is (wC hR) for compact width, Regular height. Select an iPhone 6s Plus(wR hC) in landscape in the toolbar. All phones in landscape are compact width and compact height except iPhone Plus. The iPhone plus models are regular width not compact. On regular width devices, usually users will hold with both hands on the sides, using their thumbs across the device for most button presses. On compact width devices, users typically will hold from the bottom for compact width devices, using the thumb up and down. You’ll now change all devices with a regular width to place the buttons on the sides, which is the easier to use place for thumbs to contact them. Click the Vary for Traits button on the right side of the size class toolbar. A popup appears. Check the Width checkbox. The toolbar changes color and displays all size classes affected. Click in the newly colored area to close the popup. You are now in the mode that changes only the devices with a regular class width. 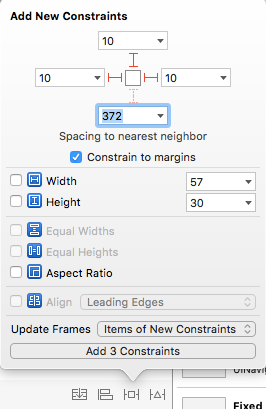 Open the attributes inspector, and change to the ruler for the size inspector. Select the Button 2. 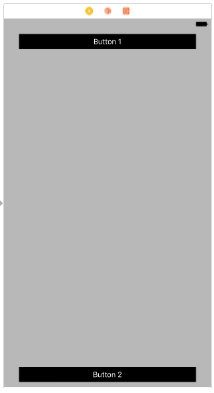 Scroll down the size inspector until you find this constraint. Press Done varying. The highlight color disappears. Change to Portrait and the buttons are on the top and bottom. Under Adaptations in the size class toolbar, click the middle button. This is a multitasking view, which is compact width. The buttons are on the top and bottom again. You can also change attributes based on the size classes. 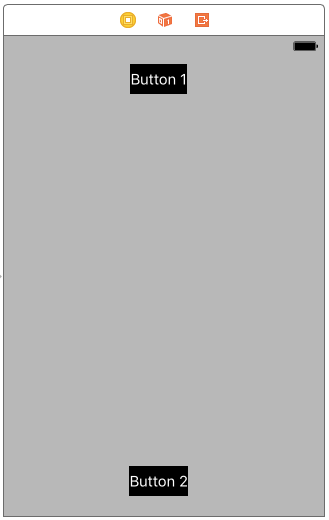 Click the gray view. Go to the attributes inspector and click the + next to the background attribute. The current device’s traits appear in the box. 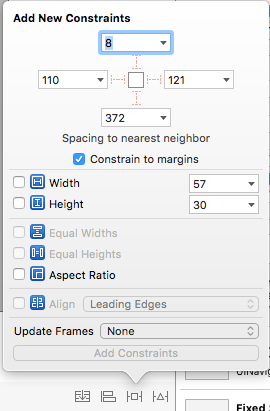 Change Width to Regular and Height to Any to make this an attribute of all regular width devices. Click Add Variation. A new background attribute for regular width appears under the default one. Change the wR background color to another color. I used Orange(#FF8000). Nothing changes on the storyboard. You are still on a compact width. Click the icon in Adaptation to go back to regular size. The background is Orange. 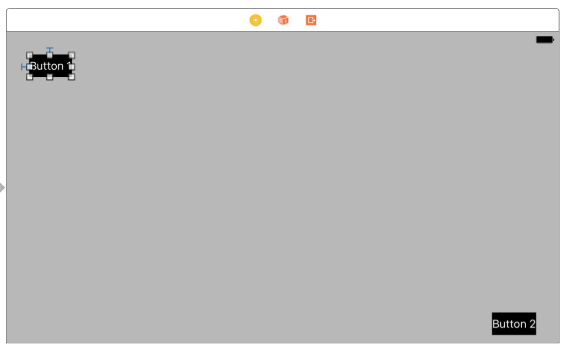 You can browse though the other devices to see which ones have orange backgrounds and which have gray ones. As you can see, Size Classes in Xcode 8 are quite powerful ways of laying out your project easily, while customizing the layout for different devices. This is sample of what awaits you in Practical Auto Layout for Xcode 8. 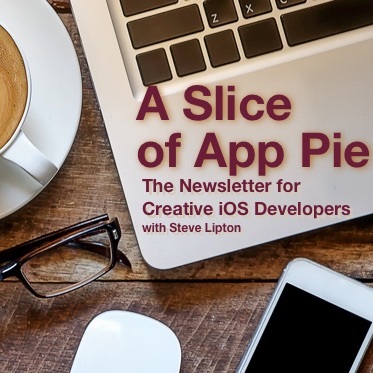 Using simple, practical, easy to follow examples, you will learn how to master auto layout, size classes and stack views on the Xcode 8 storyboard. You will learn how to make universal apps quickly easily and in far less time than ever before. Actually, following this guide i was able to do what i wanted on an ipad interface. The only thing which is not clear is: how do i actually change the constant of a constraint, for a specific size class only? The tutorial, just shows how to delete and create a new constraint, but why do this if i have to (if…) modify the constant just for that size class? Once you specified a size class to vary, just modify the constant for the constraint. Xcode keeps track of those changes. To make the Button 2 smaller for example, Click the iPad, vary for traits and select width. 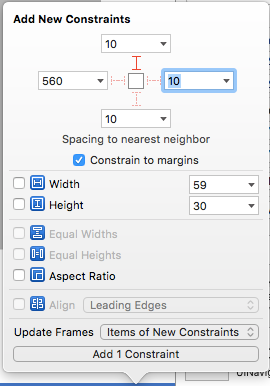 In the size inspector click Edit for the Top Space to Top Layout Guide constraint.Change from 10 to 100. Press Done Varying. You’ll note in the size inspector a button that has this class size and all class size just above the constraints. This let you see which constraints you’ve made to specific class sizes. the one dimmed out do not apply to the currently selects class size. I’ll warn you be careful with this. Most of my conflicting constraints start with modifying constraints like this. No problem. The Practical Autolayout for Xcode 8 book I’ll be publishing in October will go into better detail..
project created in xcode 7, UI changed in many xib and also layout conflict are there in xcode 8 , how can we solve that ? If things are a mess, I’d try cleaning out the constraints and starting over. removing the constraints keep everything in the same size. Generally here’s the rule for dealing with constraint conflicts: the error panel will tell you all the conflicts. you need to delete constraints until you are left with one per conflict. It’s your task to figure out which one. You can also check for dimmed out constraints that are causing the conflict.Those are ones found in specific size classes. A big culprit is always iPhone 6Plus for constraints that are messing everything else up. IF you made a change to regular height constraints on an iPad, it will affect the phones in portrait. If you want to make changes to an iPad, change the width only. General rule which even Apple follows in presenting modals is to specify the device by the width only. the only exceptions are iPhones in landscape which have a compact height. The big pain in the posterior regions is the iPhone plus which has the regular width, compact height. Not a few years ago before auto layout, which was what I was referencing. As for after auto layout yes, a regular height, regular width device is an iPad, but I tend to stay with the width only because of the plus and multitasking panes. There’s less chance of conflicting constraints if you make a layout for all regular width devices first and specify the iPhone plus as a regular width, compact height last. You are welcome. Wish I had gotten the whole book out in time. This is a big shift for a lot of people. The practical Autolayout book for Xcode 8 should be out in October. The only thing which is not clear here, is how to edit constraints for iPad in landscape. iPad size class is same in portrait and landscape. (both are W-Regular H-Regular). what can I do? That is the $1,000,000 question. 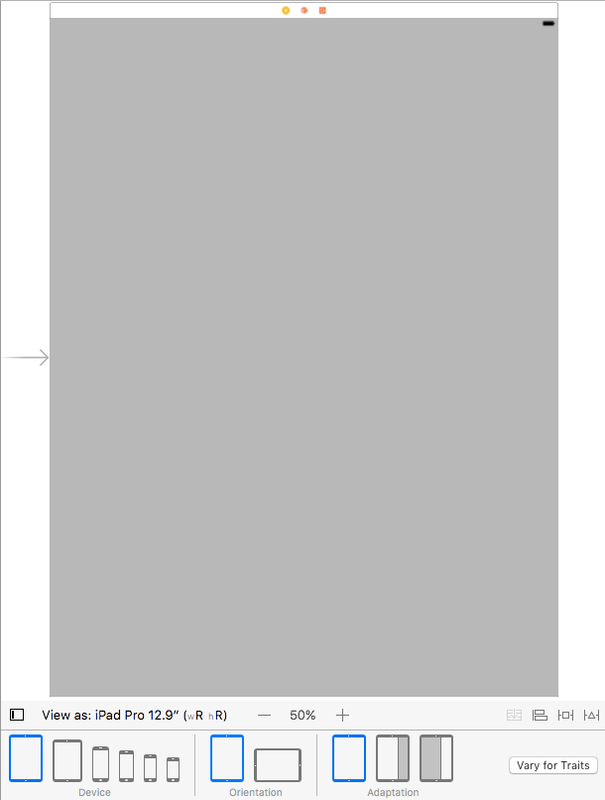 Apple for some reason has the size classes as though the iPad is square, which is why the Xcode 7 storyboard is square. 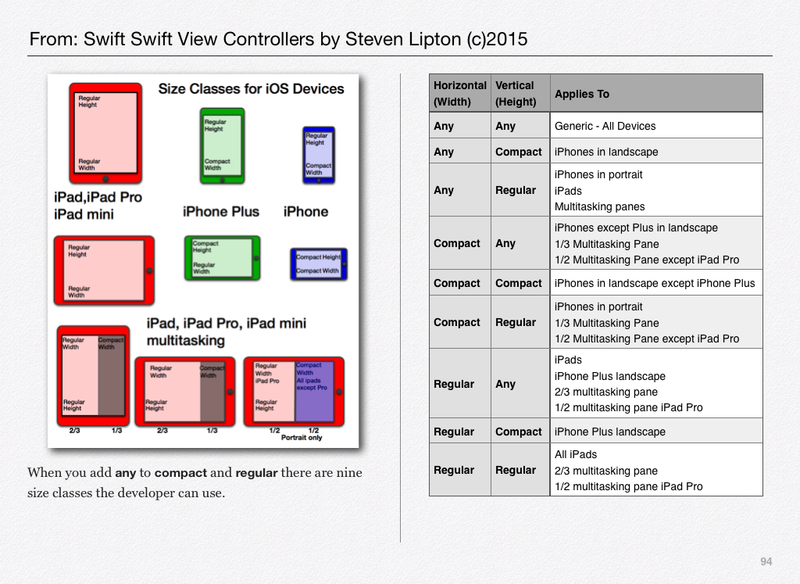 A lot of landscape cases involving split-views or multitasking are taken care of for you. I have no good idea that I’ve actually tried. That said there are a few hacks. If you really need to do something different in landscape, you could change the size class in your application to Height:compact and design for an iPhone 6 plus. That would be in the traitsCollection property. That’s an article and a half to describe, but there’s the current class reference. There is a wwdc2015 video on trait collections, but I can’t seem to find it. It may be buried in one of the auto layout ones. Hi Steve, yesterday as a beginner I bought your e-book for the ‘Practical Autolayout for Xcode 7’ from Amazon not realising the changes to Xcode 8 which I have installed. I must admit I am now stumped, only getting to Chapter 3 of your book and it says Size Classes default to wAny hAny which they no longer do in Xcode 8 and I cannot find out how to reset this default. I’m late on the book release and its one reason I posted this lesson. I’m hoping for late October release on the Xcode 8 version. 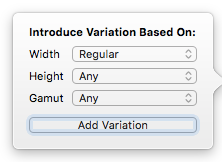 As long as you don’t hit the Vary for Traits button, you are in width:Any Height:any. So for chapter 3, don’t do anything, you are already in that default. This post will replace chapter 5. In chapter 6, when I discuss Any Width, Compact height, click the iPhone6s, and landscape. Select Vary for Traits, and check on the Height only. When this or any chapter I vary constraints is complete, click Done Varying. When I discuss in Chapter 8 Width:Regular,Height:any Click the iPad (Landscape or portrait doesn’t matter), click the Vary for Traits button for the width trait only. In Chapter 9, When I discuss the Width:Regular,Height:Compact Click the iPhone 6s Plus in landscape and select both height and width. Anywhere else in the book where those size constraints come up, use those sizes. Like I said I’m looking for an October release. I’m very aware the sooner the better. Thanks Steven, it is all starting to make sense now with that additional information. You are welcome. It was a great question. Than you very much for asking it. This weekend I need to get an errata page up for those with the same problem. My apologies for not getting the new version out sooner. Steven, Thanks very much for this great tutorial. 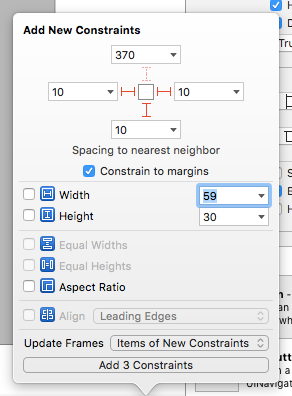 I’m new to iOS development and have been studying Xcode and just moved to Xcode 8 and noticed that auto layout has changed and found your tutorial. At first I wasn’t ‘getting’ what you meant by you are ‘always in any/any mode’, but after going through the tutorial it made sense. I think this new system is much better than the earlier one. Your tutorial is great; it just has enough info to illustrate the major points; obviously to get fluent with it one must use it and practice. Thanks again! Youare welcome. The full book this is a excerpt from should be done shortly. Thanks for the info; I will be eagerly awaiting the book. Roughly, when will it be available to purchase? Not sure how long it typically takes from the time a book is completed to when it is available to buy. I’m desperately trying for a November 1st publication date. Hopefully I’ll make it. Yes. Constraints you change in vary for traits. Attributes (and selected attributes at that) can be varied by class size only by the plus sign. You can hit the plus while varying for traits too, where it will default the traits in the popover to the current variation. Steven, Thanks for the feedback. Good luck with fighting the resistance at the end of the project and enjoy the remainder of the World Series! Generally that comes from updating without enough constraints. Select each view n the document outline and add moe constraints first. Any view needs at least enough constraints to specify a position and a horizontal and vertical size. Thanks Steven for the info, but if I want only portrait for my wC hC for a view how do I turn off landscape? Compact Height is iPhone landscape. If you Don’t want it, Don’t use it. If you don’t want rotation, click it off in the property list for the project. I just want the rotation off for wC hC which will be for iPhone 4-6s landscape. Thought I could do this using “vary for Traits” but I don’t see where you can turn off rotation in storyboard. You can’t. That’s a auto rotation setting, not an auto layout setting. Autorotation is in the view controller, not the view. In code, you’ll have to check the traits in the view controller and prohibit wC hC from rotating. I’m not sure what the code for that is, but that’s what needs to be done. Thanks for confirming, I kinda figured it out after I posted and found most of the code in a WWDC16 video. That’s a very a very cool way to do it. 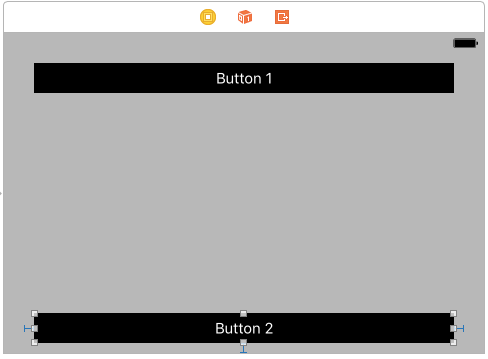 Hey Steven Lipton That’s a great tutorial, but i want to create 3 buttons “side by side” for 3 rows (Total 9 buttons) and i want to see all are placed well for all iphone’s(4s,5,5s,6,6s,6splus,7 and for ipads ) while i am taking one device simulator and creating it is working for that device only when tested in other simulator it gets overlapped or buttons gets conjusted (improper fittings) so how to make and see for all iphone devices any tutorial or documentation will be greatly appreciated Thank you. The easy answer is stackviews. Make three rows of three buttons each. Select a row of buttons and hit the stack view button . Set the attributes of the stack view to horizontal axis, Fill alignment and fill equally distribution. Do the same for the other rows so you have three rows. Select the three rows, which is best done in the document outline. Hit the stack view button again. Set the attributes to Vertical axis, Fill alignment Fill equally distribution. 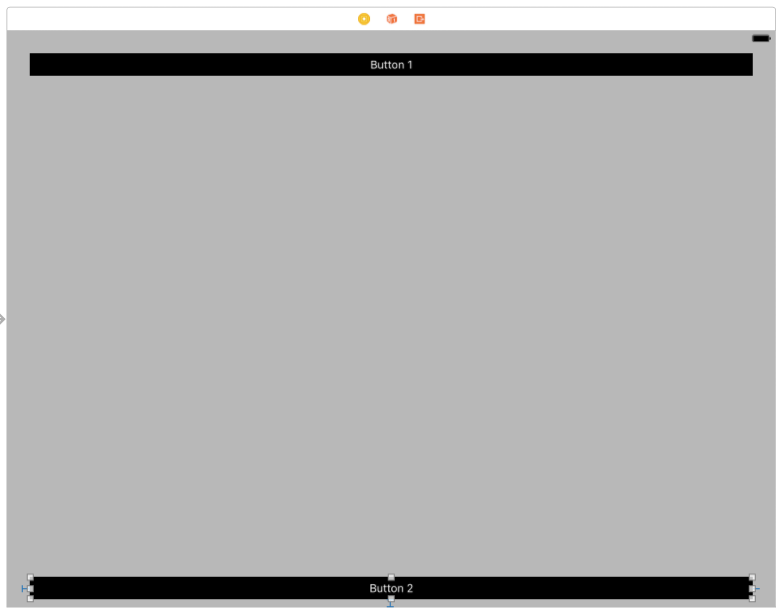 Pin the stack view to the super view using auto layout. Be sure to pin all four sides or give a size since stack views have no intrinsic size. Speaking if intrinsic size. I’m thinking you forgot to set the width or height on one or more of your buttons. Check all of them to see what is going on. You probably have a ambiguous constraint error somewhere as well which might help you find the problem. Steven, thank you, that outline was most excellent and helped me reassess a layout i was troubled with!